An ancient custom of "bottle-kicking" in a Leicestershire village is to go ahead this year despite a reduction in police cover. Organisers of the Hallaton bottle-kicking and hare pie scramble threatened to cancel the event after there was no one to marshal it. But local people have stepped in at the eleventh hour to make sure the tradition continues. The bottle-kick takes place each Easter Monday near the villages of Hallaton and Medbourne. The centuries-old tradition has only been cancelled once in its history - in 2001 because of foot-and-mouth restrictions. 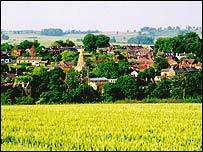 It begins with a parade through Hallaton with local people carrying a large hare pie and the three "bottles". Parts of the pie are thrown to the crowd for the "scramble" before the bottle-kicking begins. That involves two teams, one from Hallaton and one from Medbourne, trying to carry three separate "bottles" - which are similar to small beer barrels - to their respective villages. Each game can last more than an hour and at times resembles a huge rugby scrum.